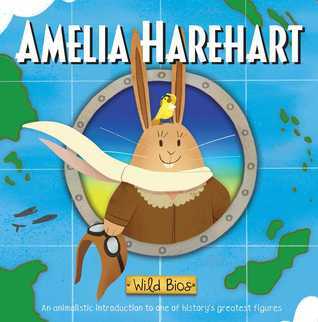 This board book introduces young readers to the famous Amelia Earhart, reimagined as a bunny. The story describes her childhood in a “burrow” playing games with her sister and their dog “Furocious”. I especially enjoyed reading about how she built her own rollercoaster in her backyard, collected newspaper clippings of “furnominal” women to inspire “hareself”, and bought her first “hareplane” The Canary. It’s so hilarious to read all the funny animal words included in the story, like “anybunny” and “hopstacle.” Those details in the writing are what make the book so special. The illustrations are so adorable and bright! I really love the colorful lines and pleasant expressions of the characters. I also loved the charming details in the background of each page, like a little yellow canary bird that flies with Amelia as her copilot. Amelia looks brave and cheerful on every page, and her determination and spirit are celebrated throughout the book. Her disappearance in 1937 is included, but the book ends on a cheerful note, saying how she inspired women around the world and will “hop on in our memories furever.” I think this book would inspire young readers to bravely take risks in order to accomplish incredible things, just as Amelia did.